Exeter has today (Friday, 29 June) been announced as the latest city to benefit from Openreach’s ‘Fibre First’ programme which is making Fibre-to-the-Premises (FTTP) technology available to three million homes and businesses across the UK by 2020. Exeter joins eight other cities across the UK - Bristol, Birmingham, Cardiff, Edinburgh, Leeds, Liverpool, London and Manchester – that make up the first phase of Openreach’s ‘Fibre First’ programme which will connect up to 40 UK towns, cities and boroughs with FTTP networks. Further details of the FTTP build, where fibre optic cables are laid from the exchange right to people’s front doors, are expected to be announced later in the year. Clive Selley, chief executive of Openreach, said: “Through ‘Fibre First’, Openreach is getting on with the job of building an Ultrafast Britain. We are building FTTP to three million premises across 40 towns and cities by 2020 and I’m delighted to announce that Exeter will be among the first to benefit from this commitment. “Since starting the ‘Fibre First’ programme a few months ago, Openreach has built a footprint of nearly 70k across the eight cities we announced in our first wave. That’s a delivery rate of full fibre to more than a thousand homes every week. “Openreach's "Fibre First" initiative is an ambitious programme - it's brilliant that homes and businesses in Exeter will now have full fibre, gigabit broadband delivered right to their doorstep." Exeter already has access to extensive high-speed broadband, with more than 96 per cent of households and businesses across the city now able to connect at 24Mbps and over*. An ultrafast FTTP network will take this to the next level providing access to speeds up to 1Gbps– that’s about 24 times faster than the current UK average of 44Mbps. Openreach’s ambition is to build FTTP to around 10 million premises by the mid-2020s, and ultimately the majority of homes and businesses across Britain if there are the right conditions to invest. 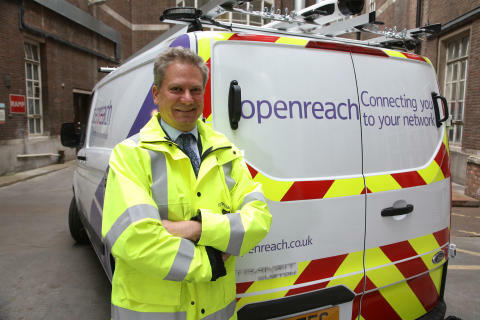 Openreach will also continue to focus on delivering FTTP to rural areas, in partnership with the Government, to make sure some of the hardest to reach communities in the UK get access to future-proofed, FTTP networks. We work on behalf of more than 600 communications providers like SKY, TalkTalk, Vodafone, and BT, and our fibre broadband network is the biggest in the UK, passing more 27 million premises. We’re also the platform for Britain’s thriving digital economy, which is the largest in the G20.